has worked alongside Colombian architect Carlos Molina (Molina Designs) in order to create a modern structure that has artistically incorporated contemporary principles of design and sustainability. Sitting atop a hillside of Mt. Washington, the design shifts away from a symmetrical approach to one that uses asymmetrical angles and curves in the facade to capture the best views of the canyons without having to the sacrifice the privacy of the home. The floor plan of the is made up of three levels; garage, sleeping quarters, and the top level is the main living area. All areas are connected by a naturally illuminated staircase that serves as the spinal cord of the home, shifting in multiple angles to incorporate the views. 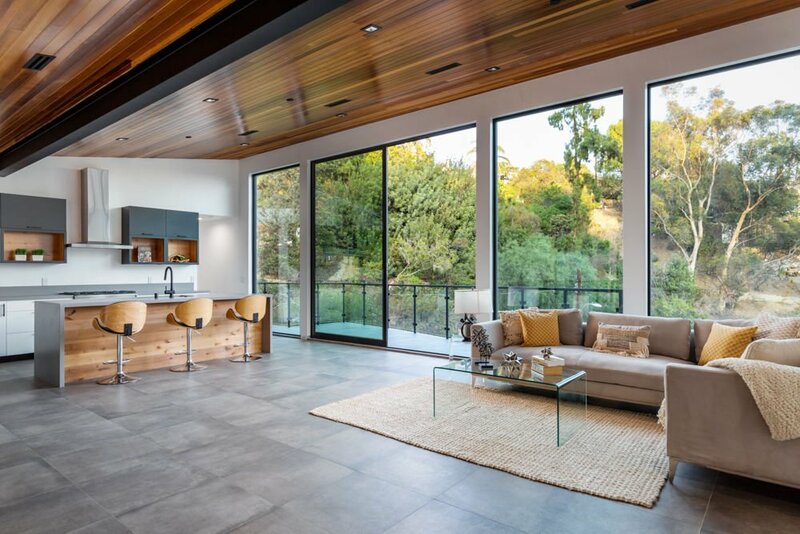 The main living area consists of one big room one side with three sides incorporating floor to ceiling windows that bring the canyons and mountain hillside indoors. There are no hallways, traditional closets or nooks visible to close off the space; all modern living activities are enjoyed in this loft-like living space. In order to include such as the expansive use of glass, large steel columns, and beams where were incorporated to allow the space to be completely unobstructed. These structural materials were left exposed and emphasized as they project outwards from a cedar wood plank ceiling that extends from the outdoor porch to terrace to the living area. Having the connectivity of lines in the roof makes it even more apparent the design premise of connecting the home to the outdoor space. The sustainability of the home was a major concern in the design and construction process. Rainwater collection systems and drainage were added throughout the hillside property to feed planter boxes, planted with drought-tolerant plants. Inside the home, all areas were designed to create cross ventilation in order to minimize the use of heating or cooling. Solar panels have been installed on the roof to even further the efficiency of the home.